Visiting a church can be an enjoyable learning experience, and an opportunity to explore the rich Christian heritage of our region. The Spirit in Stone project has been helping people of all ages to engage directly with the rich and diverse heritage of our historic places of worship. There are hundreds of these wonderful church buildings all around the North East of England, and most are open to visitors either daily or by arrangement. Many of these churches welcome visits for the purposes of learning. Group learning activity visits are best done by prior arrangement. This website offers you ideas and helpful advice for exploring these churches, to help you find places relevant to your interest, explore themes and get the most out of your visit. To start your journey of discovery you can watch a video introduction on YouTube - and then you can search for churches to vist via our directory or via our map, or find other ideas for exploring churches - just follow the topical picture links below. A set of seven videos featuring the stories of six Northern Saints - narrated by John Grundy - are available to watch on YouTube. Some more stories can be found here - but historic churches are full of stories, so start exploring some near where you live! 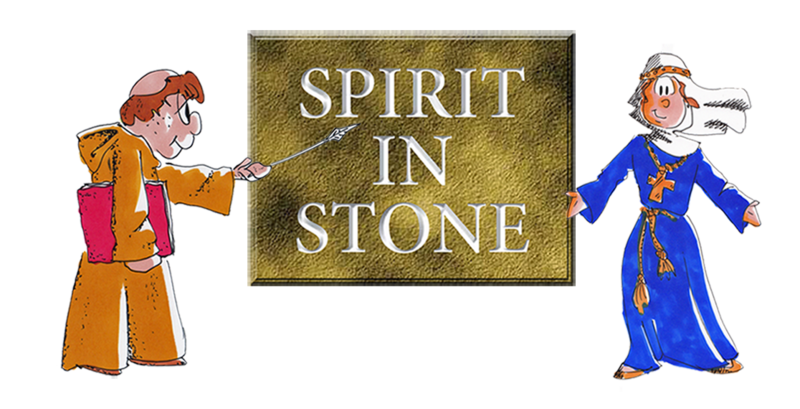 Find out more about the Spirit in Stone Digital RE Resource for primary schools in the North East, designed to support the teaching of Christianity in Religious Education in Key Stages 1, 2 and 3. Download a full copy of the latest version of the Spirit in Stone Digital RE resource.